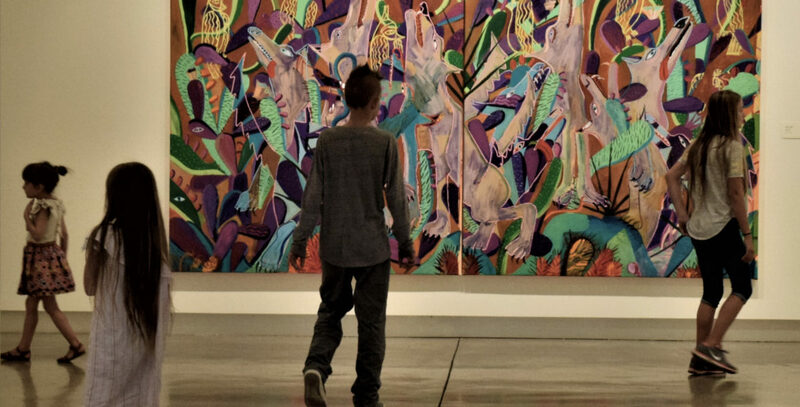 The Schneider Museum of Art would like to encourage you to schedule free tours of the summer exhibitions featuring artists Tofer Chin, Ryan Schneider, Liz Shepherd, and Amir Fallah, are available through Friday, September 8. We offer a variety of tour options that will help you tailor your visit to the standards you would like to meet. The exhibition is on view through Saturday, September 9, 2017. Sign up for a tour by filling out our tour request form. Or, you are invited to our Free Tuesday Tours! Docent-led tours are available on a drop-in basis every Tuesday at 12:30. Join us to learn more, ask questions, and engage in a dialogue about the exhibition. You can reach our education program for questions by email at smaeducation@sou.edu or by phone at (541) 552-6389. Best for community/university groups. Full tour of the current exhibition discussing the art, the artists, and their techniques. Time requirements for this tour are flexible. Recommended group size of up to 30 participants.